Melbourne ‘Fine and delicate yet striking and strong, Melbourne calligrapher and illustrator Lynne Muir is like a piece of golden filigree. She reflects her intricate work and the steady calm it engenders. 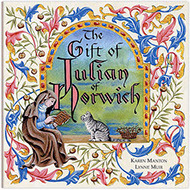 But Lynne’s calligraphy, design and illustration are not merely decorative. She is also prolific in her output. How does she manage to be so productive while maintaining such a high standard? ‘Discipline!’ she laughs. ‘I get inspired and drawn in; tracing the labyrinth of line around a spiral or a flourished tail becomes like a meditation’. ‘Lasting influences of middle-eastern and Celtic designs imbue the paintings covering the walls of her house as well as her calligraphy. The calmness radiating from her work comes from her own ‘sense of order instead of wanting to explode conventions.